Breakthrough Prize ceremony: Oscars of science honor mathematicians, life scientists, physicists. How many Hollywood stars does it take to make mathematicians glamorous? 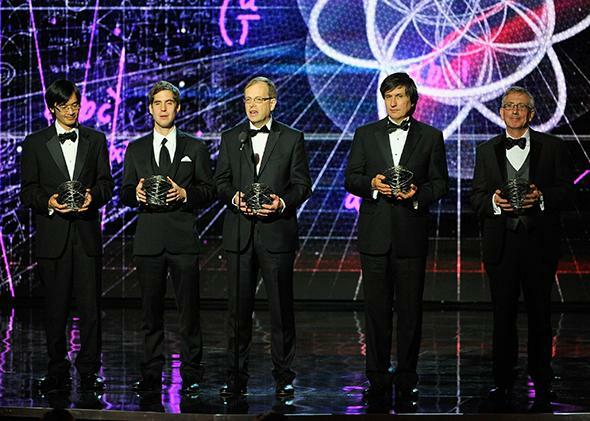 Not a boy band: From left, Terence Tao, Jacob Lurie, Richard Taylor, Maxim Kontsevich, and Sir Simon Donaldson speak onstage at the Breakthrough Prize awards ceremony on Nov. 9, 2014, in Mountain View, California. Internet billionaires flew 14 scientists to Silicon Valley last week to turn them into “superheroes,” into “rock stars.” Tech investor Yuri Milner, who created the first of the Breakthrough Prizes two years ago and co-sponsors all of them, called them the “Oscars of science,” and the black-tie affair honoring the prize winners, staged in a 198-foot-high former airship hangar in Mountain View, was a small-scale copy of the Academy Awards ceremony. The entertainment press, led by Variety and Vanity Fair, got to write about award presenters such as movie stars Benedict Cumberbatch and Cameron Diaz; high-tech titans Mark Zuckerberg and Laurene Powell Jobs; and the glittering elite of Hollywood, tech, and the media. The winners received $3 million—the equivalent of nearly three Nobel Prizes—and a small trophy. And TV audiences get to watch the proceedings on the Discovery and Science channels and the BBC, perfectly timed to fit into an hour slot, with Christina Aguilera singing a song halfway through. Speaking on the red carpet, Anne Wojcicki, CEO of 23andMe and one of the sponsors, stated the premise of the prizes: “We want to make it so that scientists are glamorized” like sports and entertainment celebrities. Milner, Forbes cover billionaire in 2011, the man Wired called “the world’s most successful investor in social media,” spelled it out in an interview with the Russian website gazeta.ru: “Intellectual achievement is not at the center of public attention, not even on the periphery … the imbalance is extremely dramatic. Our prize is an attempt to show that science is cool, fun, and interesting. That accounts for the size of the prize, and all the rest”—it’s why he “outflanked” the Nobels, as gazeta.ru put it. This year, for the first time, five mathematicians joined physicists and life scientists as prize winners. And so the mathematical investigator who is writing these lines drove down from Berkeley to Mountain View to answer an urgent question: How much of this Hollywood glamor will rub off on mathematics? Whatever one may think of the motivations of Milner and Zuckerberg, the two sponsors of the math prizes, the list of laureates was flawless. And I’m not just saying that because I have been collaborating with one of them for more than 20 years. In his blog Not Even Wrong, my Columbia colleague Peter Woit found fault with the list of the winners of Milner’s Fundamental Physics Prize in 2012: too many string theorists. But he was pleased with this year’s choice of winners in mathematics—Sir Simon Donaldson, Maxim Kontsevich, Jacob Lurie, Terence Tao, and my collaborator Richard Taylor, who among them cover most of the branches of pure mathematics—and only a few inveterate cranks and contrarians could disagree. Tao—the only math laureate with any social media presence (29,000-plus followers on Google Plus)—was a guest on The Colbert Report a few days after the ceremony. He is articulate, attractive, and the only one of the five who has done work that can be made accessible to Colbert’s audience in a six-minute segment. But Colbert framed Tao as a genius (which he assuredly is), not as someone who can get them jumping up and down in the aisles. As I watched the proceedings from the safety of the press tent, listening to paparazzi boast or complain (“I yelled, ‘Hey, Twitter!’ ‘Hey, Dropbox!’ But they didn’t stop.”), I felt the edge of my cynicism go dull. There were no crass reminders during the ceremony that the business model of Google and Facebook and the rest hinges on turning our personalities into merchandise. The presenters’ scripts were predictable, host Seth MacFarlane’s jokes inspired groans, the background music was suitably bombastic, and I’ve never seen the point of Christina Aguilera’s music. But the clips describing the work of the life scientists and the physicists were remarkably well-done, and the winners in these categories were given ample time to open up about their work and just how much fun it was. When it came time to bring on the mathematicians, though, the production ran out of steam. The day after the ceremony, Milner, who had done graduate work in physics, was at ease on a panel at Stanford with the five mathematicians. The scripters of the dinner and the TV special, on the other hand, couldn’t figure out how to fit them into the narrative. Their work cures no disease, extends no lives; it says nothing about the mysteries of the cosmos. In the end, the five mathematics laureates were crammed into a single video clip and a 30-second collective thank-you speech—cut to 16 seconds for the TV version—leaving them looking like spare stage props in what is after all an elaborate branding operation. Even the Science magazine dispatch neglected to mention their names. So the mathematicians flew home rocking neither more nor less than when they arrived. All of the Hollywood presenters felt obliged to apologize for their poor grades in math, cementing the lesson that mathematicians don’t think and feel like ordinary people and certainly know no songs anyone wants to dance to. Vanity Fair found the space to drop the names of several dozen celebrity attendees in an article shorter than this one and managed not to identify any of the winners. For fortune.com, Milner’s Oscars of science are the “nerd awards.” Milner and Zuckerberg have made their billions in social media, but they still have a few things to learn about society.